If I was ever in any doubt about the power of women together, Constance Hall blew that away last week. My lovely daughter-in-law to be Faye, treated us both to an afternoon with Con and a meet and greet afterwards and it was mind blowing. I don’t think I’ve ever been in a room with so many stories that needed to be told, heard and listened to. Ladies attending the event shared some of their thoughts and reflections of their current and past lives, their strength, anxiety and love. Sat listening to it was hard at times, but not as hard as some of the narrators lives. But what stood out was not only the stories but the reaction to those who were talking- sheer love, non-judgemental support and in many cases perfect signposting to help, courage and action. As I said, it was mind blowing and truly unique. There is a reason that Queenhood is so high on the universe’s agenda. Self-empowered women are the change this world is in dying need of. There’s no stopping the power of a woman who believes in herself. Whether it is the reaching out of a hand to the less advantaged or just a crown tip to a Queen whose three-year-old just got done for shoplifting. Queens don’t leave anybody behind. We use all that compassion and all that empathy and we run wild with it. She’s not anti-men, but a feminist who believes that women are equal and deserve to be regarded as such and I agree, wholeheartedly. 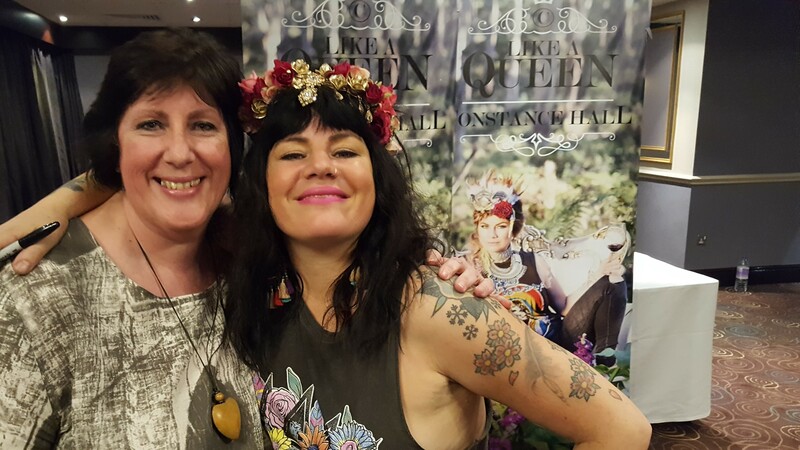 Faye and I arrived at the event expecting to be entertained by Con, we left thoroughly in awe of Con and the other women there, emotionally drained and recharged at the same time. Whatever your context, give and seek compassion, acceptance and suspend all judgement; you never know whose going through what. Sometimes you need to ask how people are and sometimes you need to be a receptive listener. You might get it wrong, switch to the wrong mode, but at least try because you never know who needs their story to be heard. Posted in #TeamPositive News. Tagged #ConstanceHall, #Queens, #TeamPositive, family, wellbeing. I think that in person she’s massively more empathetic and connected. To watch her enabling people to chat about things that were on their mind, not judging them and not saying ‘I know what you need to do……’ was inspiring. I believe she’s wonderful ‘social glue’.